There are many different types of skiing and you can find snow skiing vacations that caters for most of them. Backcountry skiing is used for all skiing that is done in the wild, i.e. where there are no lifts, circuits, etc. Backcountry snowboarding is snowboarding in the wild, i.e. where there are no lifts, circuits, etc. 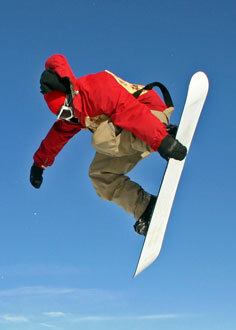 Free skiing is about executing as many tricks as possible and staying as long as possible in the air / off the ground, i.e. includes back flips, spins of 360 degrees, etc. Some of the above types of skiing are more dangerous than others are, and some are for expert skiers only, e.g. glade skiing, speed skiing and ski jumping. The most popular recreational types of skiing include alpine skiing, snowboarding and crosscountry skiing. As well as all kind of variations of downhill skiing, like telemark skiing, heliskiing, ski touring, etc. The best snow skiing vacations offers you the opportunity to participate in number of types of skiing. Family Ski Vacations - Read our advice on what to look for when choosing ski vacation and find the best ski resorts for families. Luxury Ski Vacation - Read our tips on where to find the best luxury ski destinations and save money by buying one through Luxury Link travel auctions. European Ski Vacation - We help you to find luxury ski vacation in Europe, whether it is finest Austria skiing, luxury Swiss ski resorts, France ski vacation with style. Kids Skiing - Kids skiing clothes needs are in principle the same as adults. Top travel tips on which kids ski clothes to buy and what features to consider when buying children ski clothes.